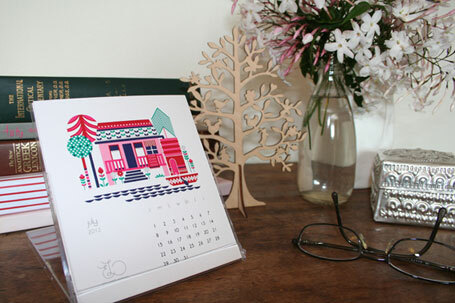 There is a vast array of beautifully illustrated 2012 Calendars available for next year from some very talented Australian artists. Pictured above and below are the works of artist Catherine Campbell. Catherine is a graduate of the College of Fine Arts, NSW and is now based in Melbourne. You can own your own print from her Etsy store - My Folk Lover. You can find out more about Catherine's art and upcoming exhibitions on her Catherine Campbell Art blog + website. 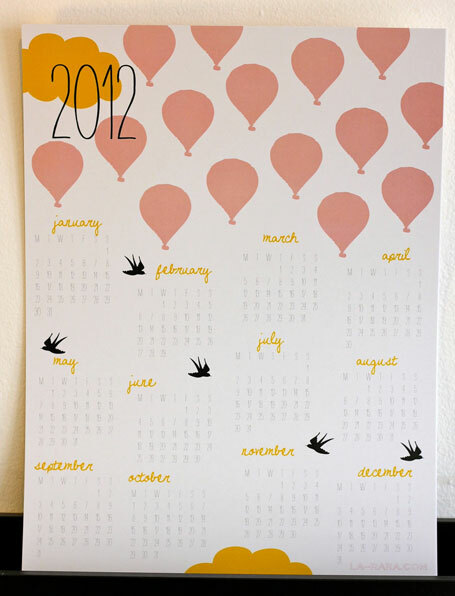 Pictured above is La Rara's very affordable 2012 calendar for a special price of only AUD $8. 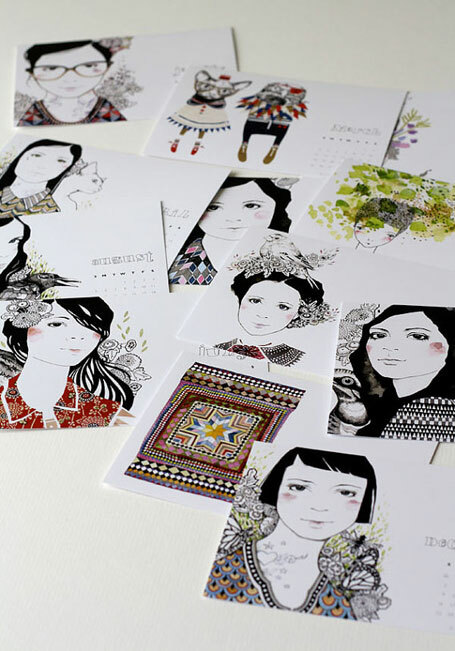 La Rara creates a range of beautiful, limited-edition, screen prints and paper goods. Each item is handmade individually in Sydney and is unique from the others. The La Rara range incorporates greetings cards, framed prints, notebooks, postcards, notecards, gift tags, invitations and bespoke social stationery. 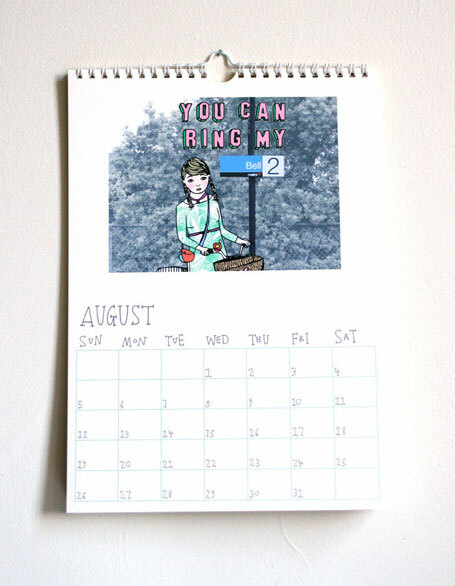 Visit the La Rara Etsy Shop to buy a calendar and more of her work or visit the La Rara website to find more information on other stockists and all the latest news. 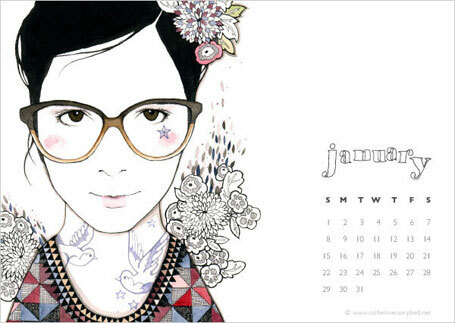 For 2012, Eveline Tarunadjaja's, calendar pages are filled with all new works from her latest show, "Threads". 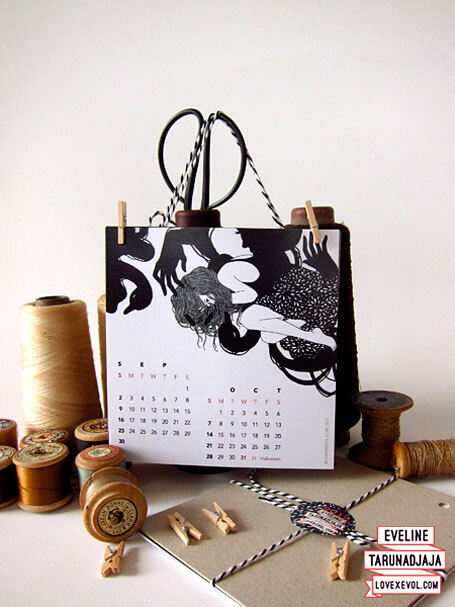 Skilfully designed by her sister, Nina Tarunadjaja, each calendar is specially made, bound and assembled with lots of love and black/white strings, and comes with a free sticker set! Her new body of work is based on the characters from a self written story. Through her characteristically delicate and detailed illustrations, Eveline toys with the nature of the human psyche, innocence and child’s play. 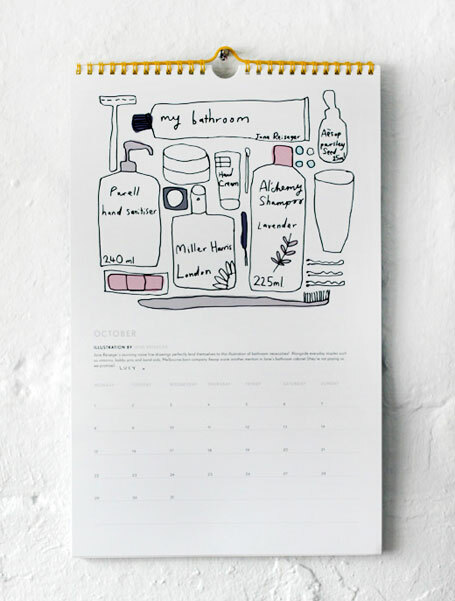 The calendar is available in both wall and desk formats. To see more of her amazing work, visit http://lovexevol.com. 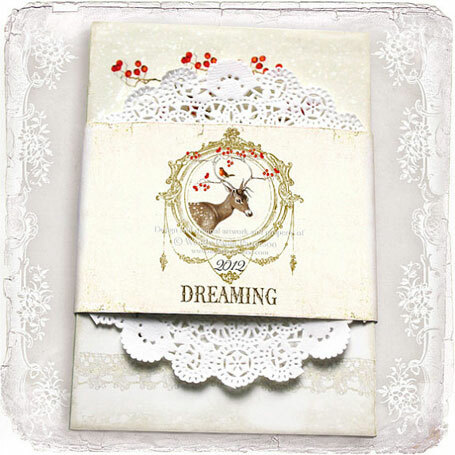 Mulberry Muse is a romantic and whimsical collection of stationary and collage prints. 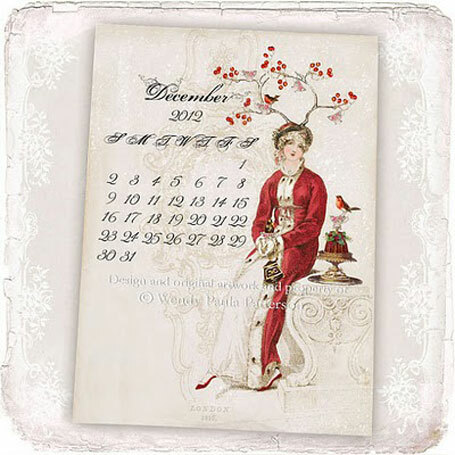 Inspired by a passion for French vintage and antique ephemera Mulberry Muse evokes a nostalgic desire for beautiful paper products including their 2012 Calendars (pictured above and below). For more information on this artist visit the Mulberry Muse website. Able and Game is a Melbourne based stationery label that creates greeting cards that no doubt stand out from the crowd. Cute couple Anna & Gareth launched Able and Game in February 2009 with a unique range of Valentine’s Day cards, using humour and real sentiment to convey messages that are quirky yet personal. 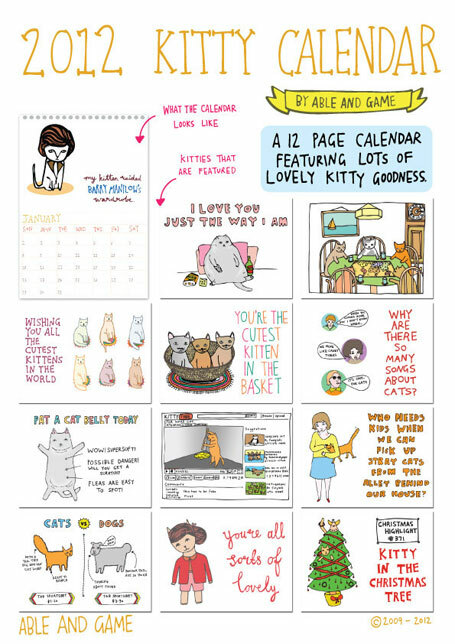 The cards feature hand drawn designs with references to pop culture and trends that people easily identify with and now they have a 2012 Calendar with that same feel. The illustrations are drawn by hand, giving the calendar an innocent quality that brings you back to the day when you used to draw yourself. Ella Leach Designs is a boutique stationery company based in Sydney whom believe that putting pen to paper is a dying art, and so strive to provide a stationery collection that is as stunning in style, as it is thoughtful in quality. Owner and designer Ella Leach is inspired by the simple, structured beauty of Scandinavian design and folk art. Pair this with her love for colour and pattern, and you have an aesthetic that is whimsical and childlike yet elegantly refined. 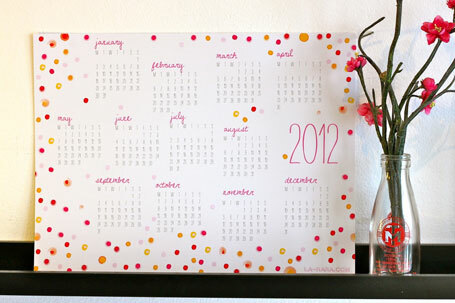 Pictured is Ella's beautiful 2012 Calendar. More information can be found at the Ella Leach Designs website. 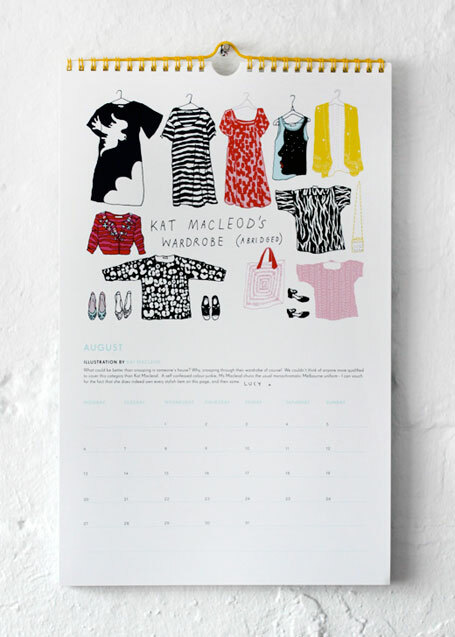 And that is just a snippet of the talent that is available in Australian Artists 2012 illustrated calendars! I hope you turn the page for a new month to the tune of these artists in the new year! Posted by Carolyn Price on Monday, December 12, 2011.
facebook launch competition - last day! TODAY is the last day to enter our Facebook competition! TWO WINNERS will each receive a $50 GIFT VOUCHER for the indie art & design store (perfect for Christmas shopping! ), as well as a double pass to see new Australian animated film, "Santa's Apprentice". 8 runners up will also receive double passes to Santa's Apprentice. To enter, simply visit us on Facebook and "Like" indie art & design! Winners will be drawn TODAY, Monday afternoon, 5th December at 5pm, and announced the same evening. Starring Magda Szubanski, Shane Jacobson, Delta Goodrem and Georgie Parker, Santa's Apprentice is a heart-warming, animated adventure for the whole family. We follow Nicholas, a 7 year old Australian boy on his adventure as he struggles with the ups and downs of being the next Santa Claus... Christmas has a way of making even the biggest mishaps alright and thanks to his loving mentors, Santa and Waldorf, Nicholas learns, as we all do, the true meaning of Christmas. For all your indie gifts! 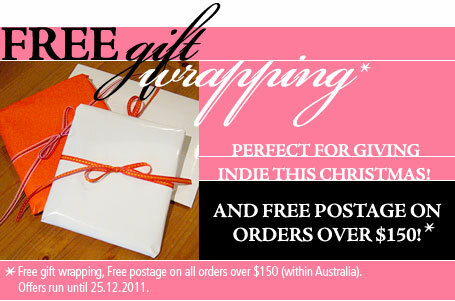 To make your Christmas shopping even easier, we're offering free gift wrapping until Christmas... and FREE postage when you spend over $150! Click here to shop online! 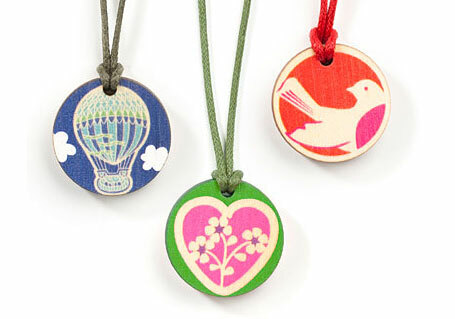 New stock is being added to the indie art & design store daily... Our latest arrivals include Polli's new range of childrens pendants, geometric tights from Love Hate, and ipad holders + luggage tags from b.sirius! So much to love... from indie art & design. Posted by Carolyn Price on Monday, December 05, 2011. The Lagoon at Snellings II by Jade Oakley. 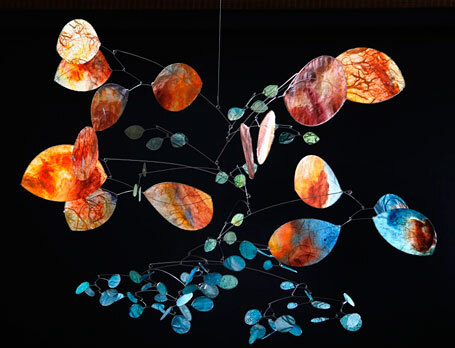 Up Lands is an exhibition of new mobiles by Sydney artist Jade Oakley. Opening tonight at Australian Galleries, Glenmore Road, the exhibition continues until December 18th. It follows on from two previous successful solo shows at the Galleries; Headland (2010, in Melbourne) and Estuary (2009, in Sydney). 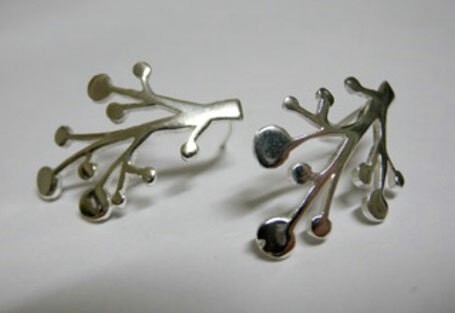 Jade's creations are delicate and incredibly beautiful. They are constantly changing and interacting with the space they inhabit - throwing reaching shadows onto the surrounding walls and ceilings. Individual 'leaves' rotate and the whole shape of a mobile can transform into something quite different, perhaps echoing the landscape from a different perspective or viewpoint. Flying Foam Passage II by Jade Oakley. Jade's new works are inspired by paintings in her diaries. "I have taken the colours and textures of these remembered landscapes and re-painted them onto hand made Japanese paper, then cut them up and assembled the paintings into mobiles. It feels like taking an armful of the landscape and tossing it into the air, so I have called the exhibition ‘Up Lands’." Sand Dunes, Cape Leveque II by Jade Oakley. 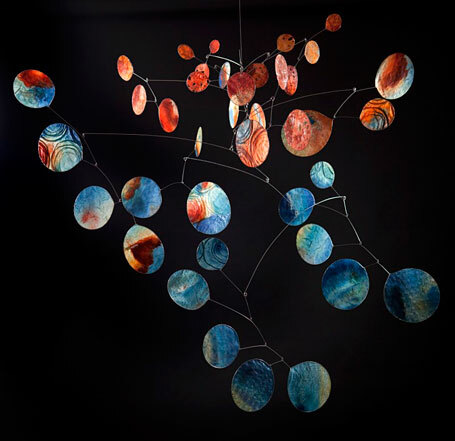 Many of Jade's new mobiles are drawn from her experience of remote coastal locations around Australia. Sparsely populated regions such as the Pilbara - with its blanket of earthy red rocks - and endless stretches of sand dunes can seem quite alien at times. In these quiet, monotonous landscapes, the small details - the elements that make up the land and the sea and the air - come to the fore. The environment can be transformed by the changing light, in turn evoking a changing emotional response. The Sand Dunes, Cape Leveque II (pictured above) captures beautifully the strangeness of a vast landscape. Your senses seem heightened, at times colours are oversaturated, (whilst at other times they seem almost bleached by the unfiltered light). The scale of such places gives you a sense of calm and awe; time seems to slow, allowing you to imagine you can feel the rotation of the earth. Sketchbook paintings of "Vermont" by Jade Oakley. 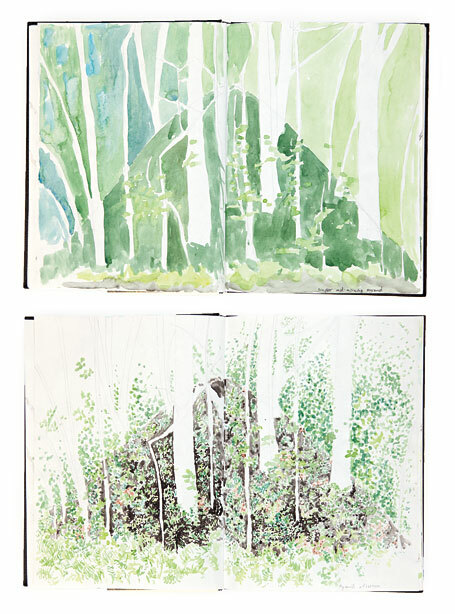 The images above are just two of many watercolour sketches Jade had recorded of the "Pyramid" in the forest in Vermont at different times during the day. 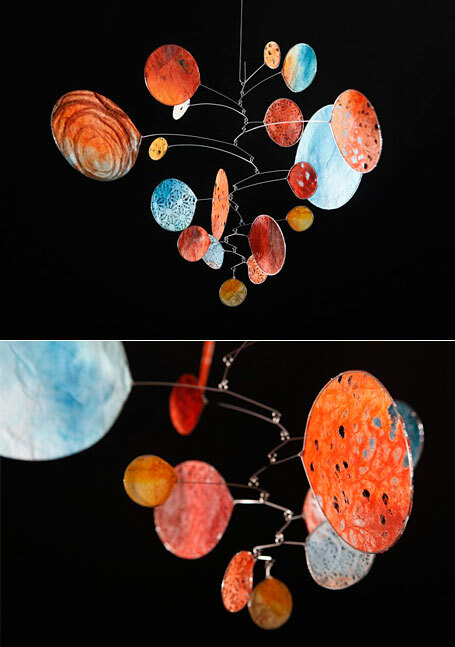 In her corresponding series of mobiles, she has interpreted the scene under these different conditions. Three of the resulting mobiles are pictured below: Mid Morning, Almost Late Afternoon, Almost Evening. The colours, shapes, composition and sense of weight are subtly varied in response to the changing light. To really appreciate Jade's mobiles, you need to see them in person! If you're in Sydney, this is one exhibition not to be missed. 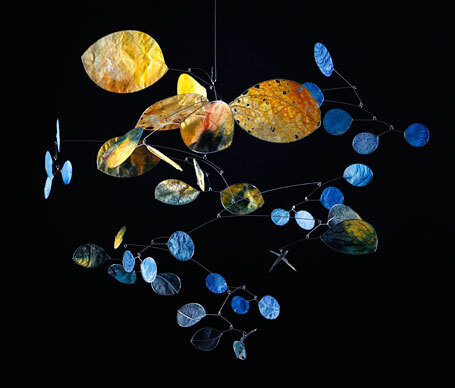 Australian Galleries, Glenmore Road will be filled with Jade's magical creations, ranging in size from very small (on their own plinths) to impressive works almost two metres in length suspended from the ceiling (and made up of seemingly hundreds of individual 'leaves'). To see her works installed together in a gallery space is really something. Not only do you walk among beautiful mobiles - you also experience the spectacular interplay of shadows from all the different works. Up Lands opens tonight, December 1st from 6-8pm at Australian Galleries, Glenmore Rd, Paddington, Sydney, and contines until December 18th. Gallery opening hours are Monday to Saturday 10am - 6pm. Posted by Carolyn Price on Thursday, December 01, 2011. Lucy from The Design Files has been super busy of late! With the launch of her second illustrated calendar (in collaboration with The Jacky Winter Group - Illustration Agency) just last week, and her exciting new Open House project opening tomorrow (following the launch party this evening), it must feel like all her Christmasses have (almost) come at once! 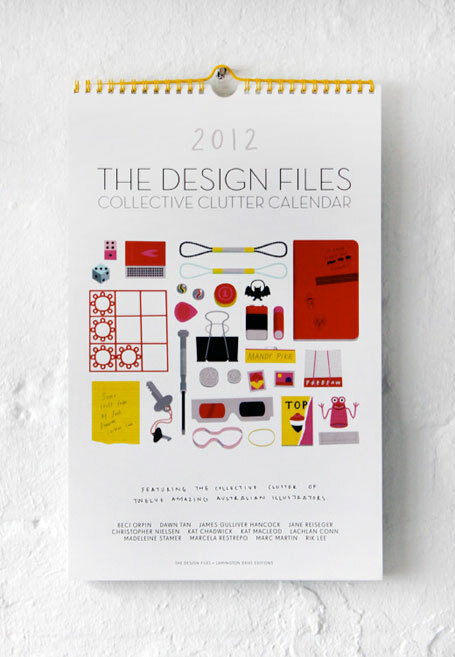 The theme for the new 2012 Design Files calendar is "Collective Clutter" and this year's artists have obviously had lots of fun illustrating their selected "contents". 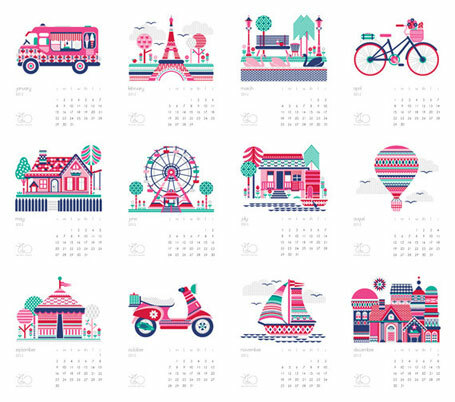 The calendar is published through The Lamington Drive Edition : a gallery space dedicated to showing the work of illustrators, cartoonists and designers represented by The Jacky Winter Group - Illustration Agency. Following on from 2011’s calendar, for which selected artists were briefed to illustrate their favourite neighbourhood, 2012 focuses on home and studio environments. Beci Orpin, Dawn Tan, James Gulliver Hancock, Jane Reiseger, Christopher Nielsen, Kat Chadwick, Kat Macleod, Lachlan Conn, Madeleine Stamer, Marcela Restrepo, Marc Martin and Rik Lee. 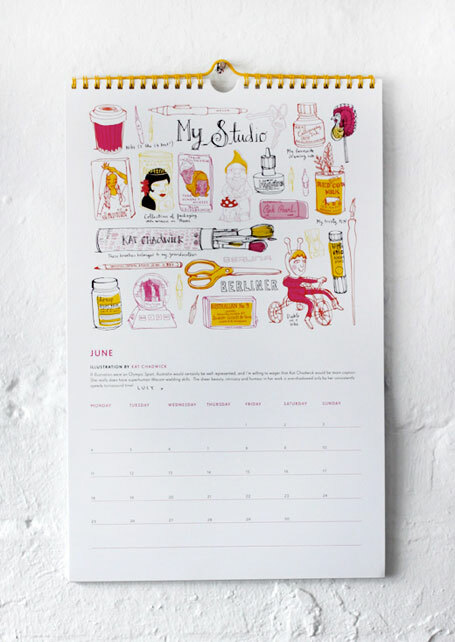 The calendar is printed on 250 gsm matte art board with a powder-coated yellow wire binding and is available from The Design Files Open House located at 40 Little Napier Street, Fitzroy, Melbourne VIC, and online from Lamington Drive for just AUD $30 - making it an ideal Christmas present for the indies in your life! There will also be a few limited edition prints of each calendar illustration available from The Design Files Open House - some of which will litter the walls during the four day event. 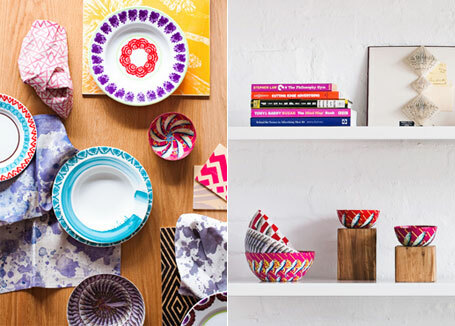 Tableware for the Design Files Open House from Safari Living + Tractor Home + many others! The Design Files Open House is a beautiful residential warehouse conversion home in Fitzroy and is being transformed to create a pop up event like no other. It is the ultimate stylised Melbourne home with an added dimension. Over 70 designers and artists have been handpicked to participate in this unique concept, and everything is available for purchase during theOpen House and online after the event. A large array of selected local designers, artists, makers and retailers' items will fill the entire house. Items can be purchased within the space and on the spot - from bed linen to books, artwork, furniture, kitchenware and lighting. There will even be a complete garden wall installed, as well as an open air rooftop cafe. Plus a flower stall by a fabulous local floral designer, cooking demonstrations in the modern open-plan kitchen, and events every day and night. Where: 40 Little Napier Street, Fitzroy, Melbourne. When: Thursday 1st - Sunday 4th December 2011. 10am – 5pm, over four days only! Online store: Monday 5th - Sunday 18th December 2011. Visit the The Design Files Open House Official Website for full details, and keep up to date by following @TDFOpenHouse on twitter. Posted by Carolyn Price on Wednesday, November 30, 2011. 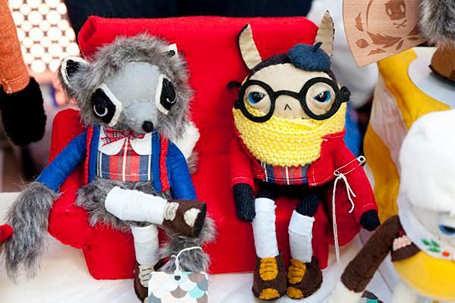 Markit@Fed Square is a bi-annual curated design market focusing purely on illustrative and decorative based designs. 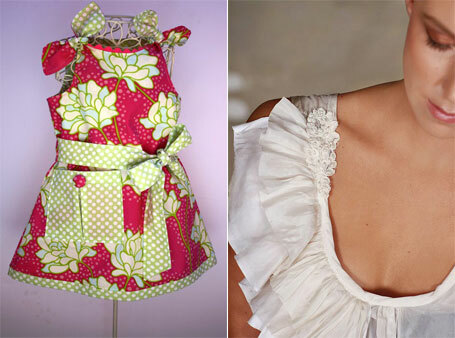 Products found at the Markit include fashion, jewellery, homewares, stationery and illustration. Markit@Fed Square invites you to meet the designers, talk with them about their products and buy something beautiful. The next Markit@Fed Square is being held on Sunday 27th November 2011 from 10am-5pm and can be located within The Atrium & BMW Edge Theatre, Federation Square Melbourne. For more information visit the Markit@Fed Square website. 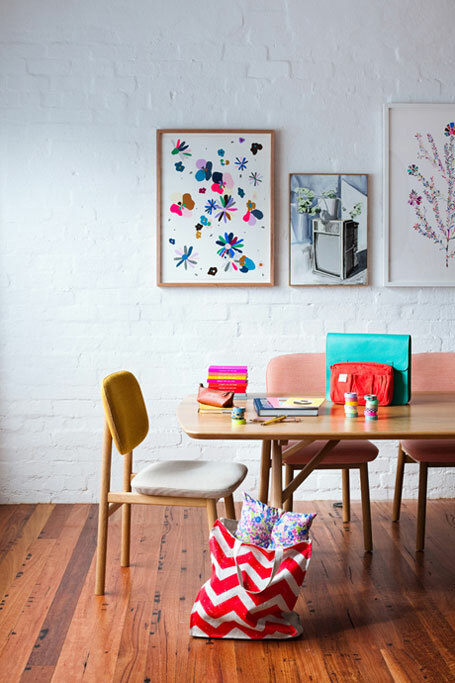 The The Finders Keepers (Sydney) Market is a bi-annual event that showcases the work of emerging designers and artists from all around Australia & even New Zealand! 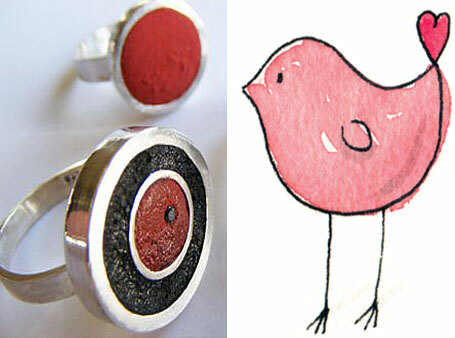 Artists and designers work is of high standard and includes prints, homewares, jewellery, homewares and much MORE! For more information visit The Finders Keepers website. 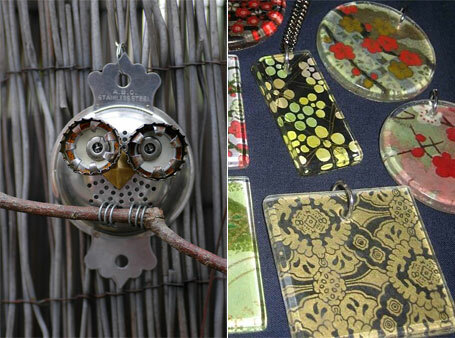 The market is constantly growing and evolving with new artisans joining the market monthly and has a strong emerging artists section with an eclectic array of exciting stalls. 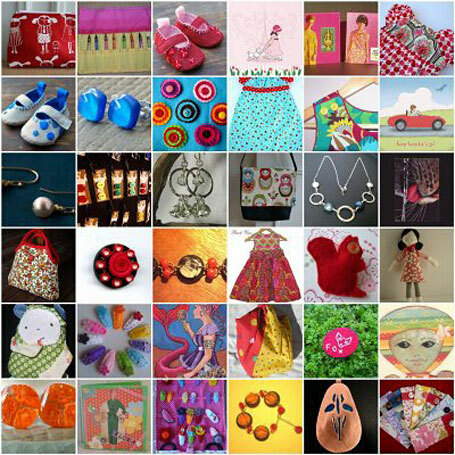 Products found at The Olive Tree Market include photography, textile arts, illustration, fashion, home wares, jewellery, printmaking, zines, recycled vintage goods, sustainable design, ceramics, wood and metal work, painting and handmade children’s clothing and toys. The Olive Tree Market is held on the first Saturday of each month rail hail or shine! The next Olive Tree Markets are being held on Saturday 3rd & Saturday 17th December 2011 from 9am-6pm (extended Christmas Market hours) and are located at The Junction Primary School, Newcastle. For more information visit The Olive Tree Market website. Magnolia Square is a curated market place showcasing the creative talent of independant artists, designers and makers from around Australia. As the originator of design orientated pop up retail in Melbourne, their concept is truly authentic, unique and continually evolving. Managed by a small and passionate team who care very much about promoting creativity in every guise, each event is carefully curated to bring together a cohesive group of artists, designers and crafts people at the top of their game. Often likened to a high end trade show, Magnolia Square is three days of experiential retail at its best. The next Magnolia Square event is being held on Thursday 1st December 10am-9pm - Friday 2nd December 10am-5pm and Saturday 3rd December 10am-4pm located at Malvern Town Hall, Cnr Glenferrie Road & High Street, Malvern, Melbourne. For more information visit the Magnolia Square website. The Rose St. Market is situated in the heart of eclectic Fitzroy, Melbourne. The market is a unique outlet where emerging artists and designers can showcase their work to Melbourne without high retail and gallery commissions. The Rose St. Artists' Market utilises a former junkyard in the back streets of Fitzroy to display the work of up to 70 artists and designers each Saturday and Sunday including some emerging and some more established. The Market has gained the reputation of being one of Melbourne's hidden treasures, wowing people with the high quality of work on offer. In a city brimming with creativity, there's no telling what products you might find. 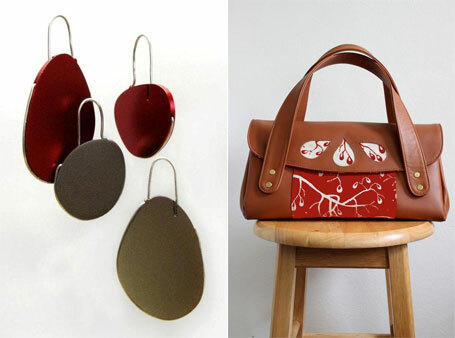 From quirky furniture design and stunning fashion through to intricate jewellery and unique paintings. The Rose St. Market is open every Saturday and Sunday between the hours of 11am and 5pm. and is situated at 60 Rose Street Fitzroy, in between Brunswick and Nicholson Streets, Fitzroy Melbourne. For more information visit the Rose St. Market website. The Handmade UpMarket is where Canberra's talented artists, designers, stylists, craftspeople and gourmets are found all at one destination. 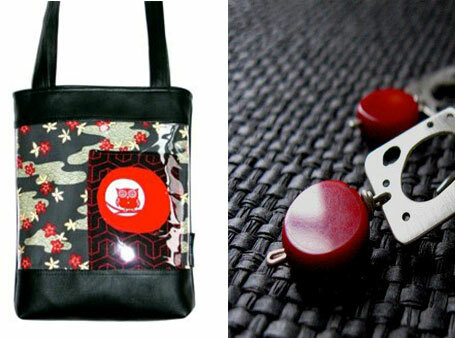 It is a unique event to connect the makers of beautiful things to people who appreciate quality, handcrafted and locally designed items. The Handmade UpMarket next event is on 17th and 18th December 2011 between the hours of 10am and 4pm and is situated at The National Convention Centre, Canberra. For more information visit the The Handmade UpMarket Canberra website. The Wollongong Art & Design Market is a special event that features products made by artists and designers residing and working in Australia. 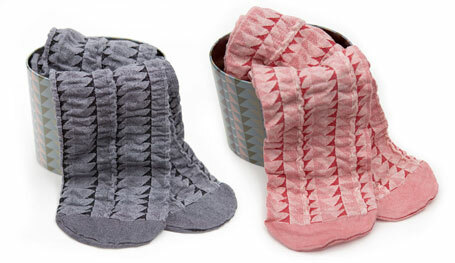 The market is a perfect opportunity to purchase and invest in unique handmade Australian designer products. The next Wollongong Art & Design Market is a Christmas Market and is being held on Sunday 27th November 2011 from 11am to 4pm and located in the Wollongong CBD – Pioneer Hall, 84 Church Street. For more information visit the Wollongong Art & Design Market Facebook page. 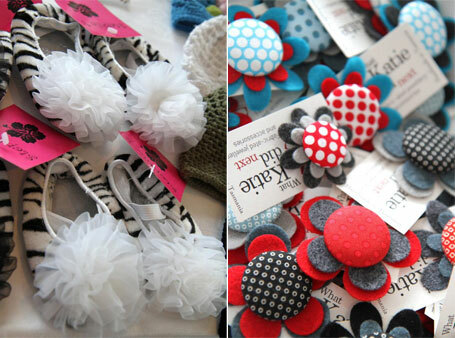 Mathilda's Market is home to the most gorgeous baby and kids goods. Mathilda’s Market carefully handpick their stall holders to bring you divine and original clothing, accessories, homewares and toys for the little ones. The markets exquisite wares are lovingly designed by some of Australia's most talented crafters and designers, many of them parents themselves. It's a shopper's heaven for those who want to stylishly dress their children or decorate their kids' home environment, but don't want to buy mass produced, chain store items. Mathilda's Markets are held in Sydney, Melbourne, Brisbane, Canberra and Adelaide, Perth and Hobart. Caulfield Racecourse – Station Street Caulfield, Melbourne on Sunday, 27th November 2011 and is a Special Christmas Shopping Market (over 100 stalls!) from 9am to 1pm. Moore Park – The Entertainment Quarter, Byron Kennedy Hall, 122 Land Road, Sydney on Sunday 4th December 2011 and is a Special Christmas Shopping Market from 9am to 1pm. The Burnside Ballroom, Cnr Greenhill & Portrush Roads, Tusmore, Adelaide on Saturday 26th November 2011 and is a Special Christmas Shopping Market from 9am to 1pm. For more information visit the Mathilda’s Market website. 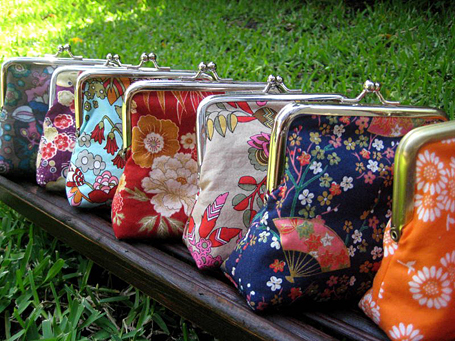 BrisStyle Indie Designer Markets feature local emerging and established artists, crafters and designers from Queensland's South East who specialise in producing quality handmade goods including handbags, sweet art, jewellery, children's wear and vintage re-creations. Set in the sweet retro hall and gorgeous leafy grounds of St Augustine's Church on Racecourse Road, Hamilton on Saturday 10th December 2011 from 9am to 4pm, this boutique event promises to provide the perfect environment for all your handmade Christmas shopping needs. 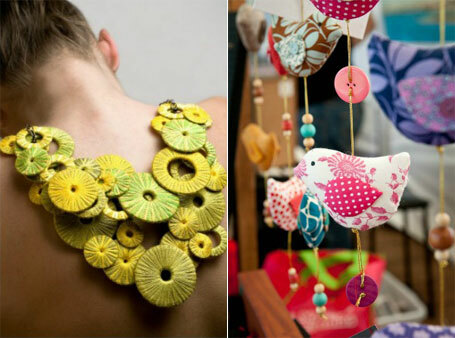 The Christmas BrisStyle Indie Designers Market gives you the chance to see first-hand why these Markets are renowned for being Brisbane's HOTTEST destination for handmade. For more information visit the BrisStyle Indie Designer’s website. Perth UpMarket brings together over 150 of Perth's premier Artisans all under one roof to sell their wares. The market is a quarterly event held at the University of Western Australia's Winthrop Hall, Perth. Showcasing products such as handmade clothing, wall art, jewellery, wood and paper products, cupcakes, giftware, accessories, toys, homewares, skin care products plus lots more. The next Perth UpMarket is on Sunday 27th November 2011 from 10am to 4pm, this event promises to provide the perfect environment for all your handmade Christmas shopping needs. For more information visit the Perth UpMarket website. 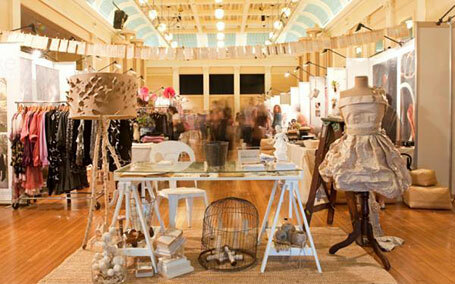 The Market Hobart is a boutique art and design event, held seasonally in the intriguing Masonic Temple. It is a well known event where up-and-coming Tasmanian artists, designers and makers can get the right sort of exposure. The market is constantly evolving, hosting a new batch of stall holders each market. This means the products on offer are always new, exciting and forever changing. The market features unique jewellery and accessories, bags, limited run stationery, art and photography, home wares, clothing, linen, beautiful garden design and innovative lighting products. Also, perfect little presents like delicious jams, homemade muesli and award winning fudge. The Market Hobart next event is a special Christmas Market being held on Saturday 10th and Sunday 11th December 2011 at the Masonic Temple - 3 Sandy Bay Road, Hobart Tasmania. For more information visit the The Market Hobart website. The PYD Design Markets will showcase Sydney’s hottest young designers at the PYD Building on Saturday 26th and Sunday 27th November 2011. The PYD Building is located in Sydney's design, arts and good living precinct of Danks Street, Waterloo Sydney. In one purpose-built space, the PYD Design Market brings together an array of over 60 designers homewares, jewellery, fashion, design objects , kids stuff, art and gifts for you to buy. For more information visit the PYD website. Sisters' Market is a great place to browse for a new find, enjoy a coffee at their communal table and discover the origin of the endless crafts and creativity of the makers. Head along and immerse yourself in brilliant locally designed clothing as well as a range of creatively crafted jewellery and accessories. You'll also love the homewards along with artworks and so much more - basically there is something here for every room in your house. 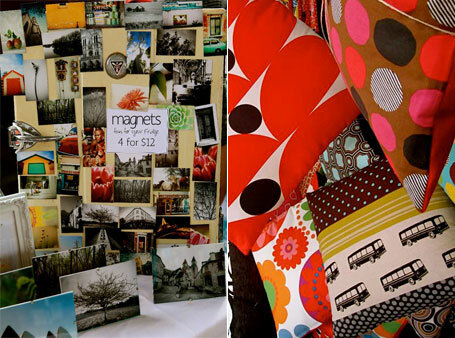 The Sister’s Market next event is on Friday 7th from 5pm to 9pm and Saturday 8th December 2011 from 10am to 4pm at Northcote Town Hall, Northcote Victoria. The Sister’s Market are also having another event on Friday 16th and Saturday 17th December 2011 from 10am to 4pm at Brunswick Town Hall, 233 Sydney Rd Brunswick Victoria. For more information visit the Sisters Market website. Posted by Carolyn Price on Friday, November 25, 2011.